Of course, the youth can not hide the substance after the short storage time, but nevertheless the stuff already beats 90% of the German whiskey. Beautifully charged by the Amaronefass you can see here, where the journey goes for St Kilian. Again, a great batch of the most clearly shows the barrel influence without, of course, to completely cover the basic character. Such a drop with an age of 6-7 years would certainly be a hammer! First of all a lot of malt, young whiskey flavors and, unfortunately, a bit bubbly alcohol. After some time in the glass it is more pleasing and it comes berry fruit, glucose, sweet and sour wine notes, a spicy ginger sharpness and yes even some ground almonds. But the alcohol always flashes aggressively. Getting better with time and after the first sip! Strong but quickly quite creamy, red fruit jelly, a lot of grape sugar sweetness, then again neat malt and warming (but now pleasant) alcohol. Surprisingly long finish that is determined by the malty character, the wine aromas add some sweetness and make the finish very supple. Then some lemon abrasion and even slightly spicy oak which also carries a touch of chocolate to the rear. 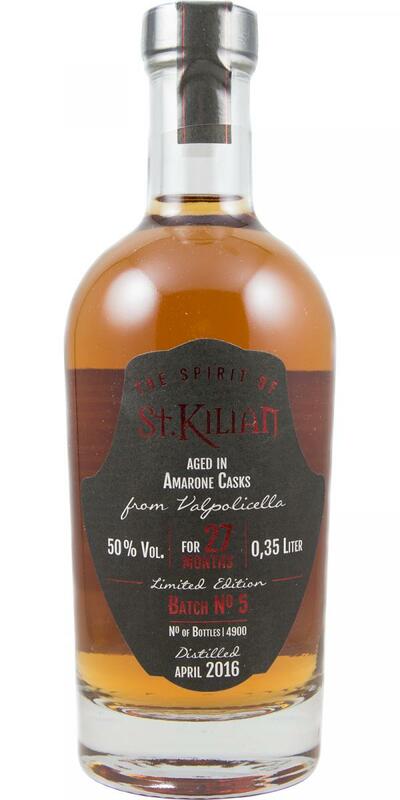 Fruity plums and fresh country apples with a touch of marzipan and spicy wood notes: we have created BATCH 5 of our Spirit of St. Kilian especially for this late summer. The fifth bottling of our barreled malting brandy matured for more than 27 months in former Italian wine barrels. The special oak barrels we received from Claudio Lenotti, to which we are friendly connected. The well-known winery of his family produces outstanding wines in Northern Italy for more than 100 years - including the well-known "Amarone". The special feature of this type of wine: After harvesting, the grapes are dried for several months, thus losing up to half their weight and therefore develop an incredible sugar and flavor concentration. No wonder Amarone is one of the best Italian wines. 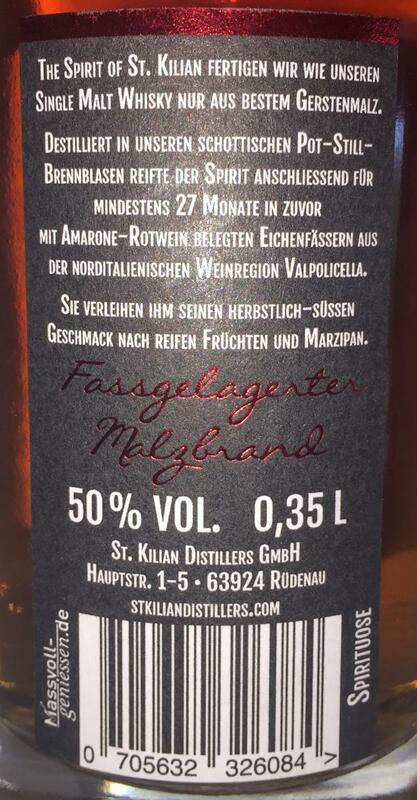 We took advantage of its special aroma through the intensive Fassreifung for our Spirit of St. Kilian. The result: a strong, fresh and malty-sweet blend of ripe fruit and marzipan - the perfect drink for balmy late summer evenings. 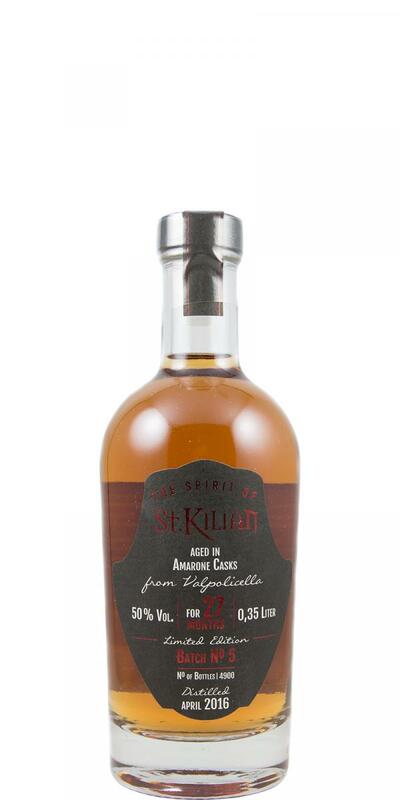 - bottled as barrel-stored malt brandy with 50% vol.